A few Sundays ago, Sam Sifton of The New York Times had an article in the Magazine Section on Chef Bobby Flay and his Pan-Roasted Chicken With Mint Sauce. In it, Chef Flay explained how to obtain a good crust on a roasted chicken breast, as he does at his restaurants. I clipped the article with the intention of trying his technique some time in the future. However, as with so many good intentions, if too much had gone by, I would have no doubt forgotten all about the article. But serendipitously, two unconnected events happened shortly thereafter. Last week, Grammy noticed that the basil plants on our deck were in full bloom and that unless the leaves were picked soon they would be lost. To our minds the best use of an abundance of basil is Uncle Fred’s Pesto Sauce. So she whipped up a batch and refrigerated it that same day. Then, the other day, she announced that she was going to defrost a split chicken for dinner that night, and was going to roast it. That’s when I remembered the Sunday Times article and was fortunately able to put my hands on it. After a quick perusal of the article, I announced that I would take care of the chicken if she would prepare the Sautéed Spinach. She gladly accepted and the result can be found at Pollo con Pesto (Pesto-Crusted Pan-Roasted Chicken)! 2. In a cast iron skillet large enough to hold the chicken, heat the olive oil on medium high until shimmering, about 4 to 5 minutes. 3. Rinse and pat dry the chicken. 4. Sprinkle both sides of each chicken half liberally with salt & pepper. 5. Gently place chicken halves skin side down in the pan, and brown for 8 to 9 minutes. Periodically place a weight on the chicken pieces pressing down to insure that the skin gets crispy. 6. Turn chicken pieces skin side up and remove pan to top rack of oven. Roast for 30 minutes, basting skin with fat drippings after 15 minutes. 7. In the meantime mix the pesto with 2 tbsp. of the white wine. 8. 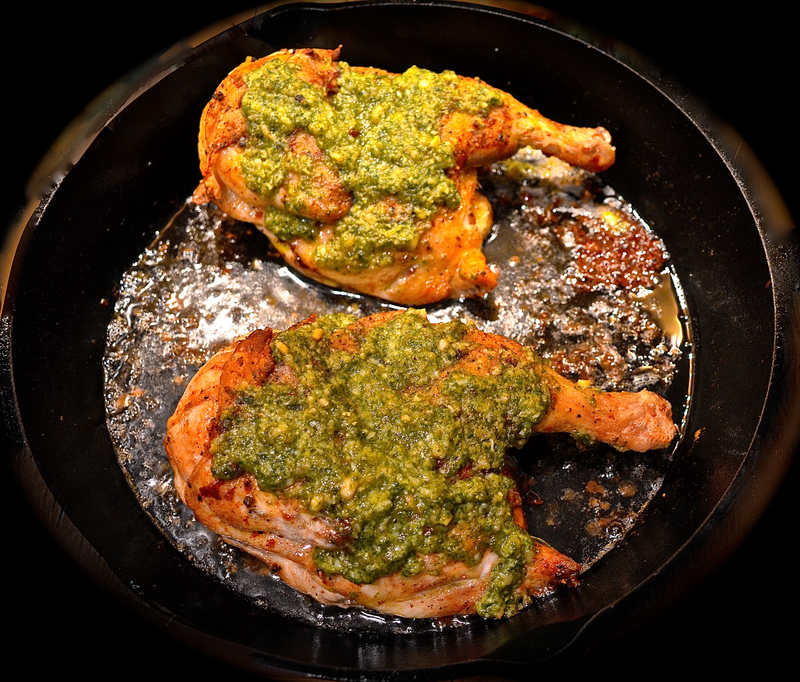 When chicken is done, remove the pan from the oven, re-baste the chicken and spoon pesto over each half. Return to oven and continue cooking for 3 minutes. 9. When done, remove chicken from the pan, set aside and keep warm while preparing the gravy. 10. To make the gravy, pour off all but 2 tbsp. of fat, retaining the solids, heat pan on stove on high, add the ½ cup of wine, bring to boil and de-glaze the pan scraping up the fond. Serve gravy alongside the chicken. Grammy suggested fish for dinner. She was thinking of something light, and juicy! Maybe with tomatoes? And salty! Perhaps from olives and capers? And she proposed that it be served en papillote, wrapped in aluminum foil and baked in the oven. Since it was incumbent upon me to dispose, I opted for parchment paper, instead of aluminum foil, as it would not be reactive to the taste. 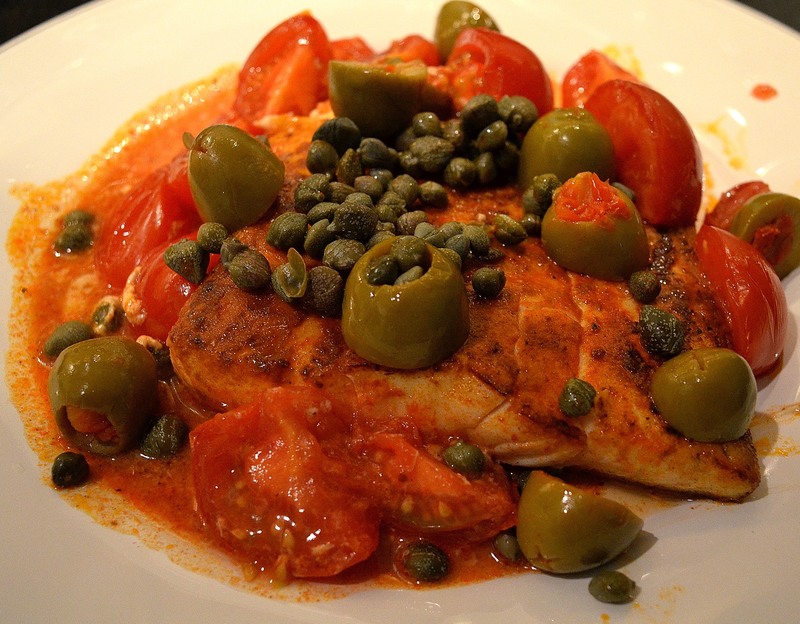 I agreed with juicy, and yes, from tomatoes; and of course salty, olives and capers would provide plenty of that. The perfect fish? Something mild, yet substantial enough to stand up to all of that flavor. As luck would have it, our local fishmonger had Day Boat Halibut that morning. Yes, that would do. I’ll have one pound please, skin removed, if you don’t mind. 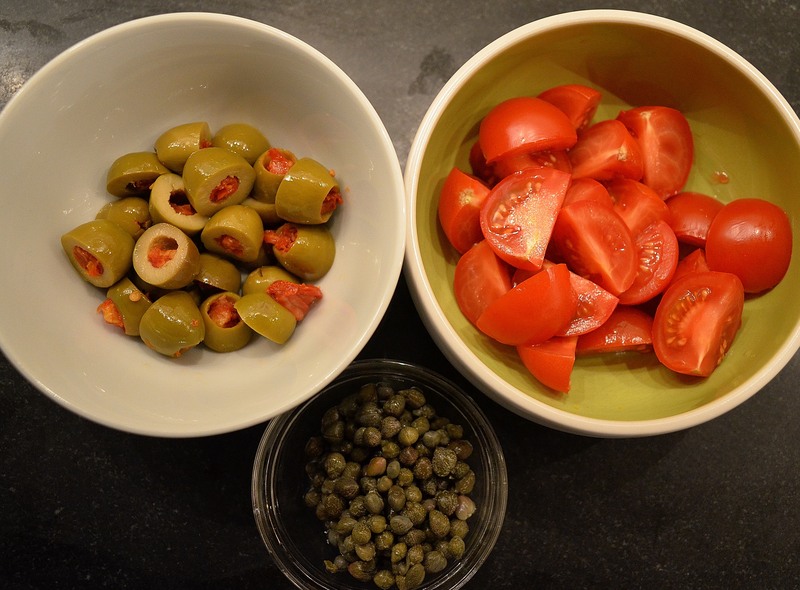 The supermarket provided the tomatoes and pimento-stuffed green olives. Our larder provided the capers, parchment paper, paprika and olive oil. Mission Accomplished! Now to put it all together see Pan-Seared Halibut Elisabetta, En Papillote. 2. Thoroughly pat-dry the fish with paper toweling and divide in half. 3. Sprinkle each side with paprika. 4. Pre-heat cast iron skillet on high for 4 to 5 minutes. 5. 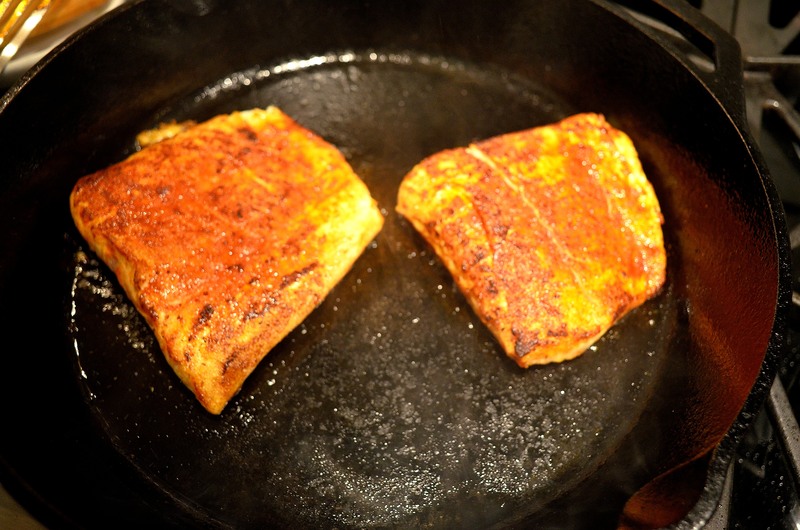 Add olive oil to the pan and when shimmering, carefully place each piece of fish in the pan. 6. Pan-sear for 1 minute, turn and repeat. 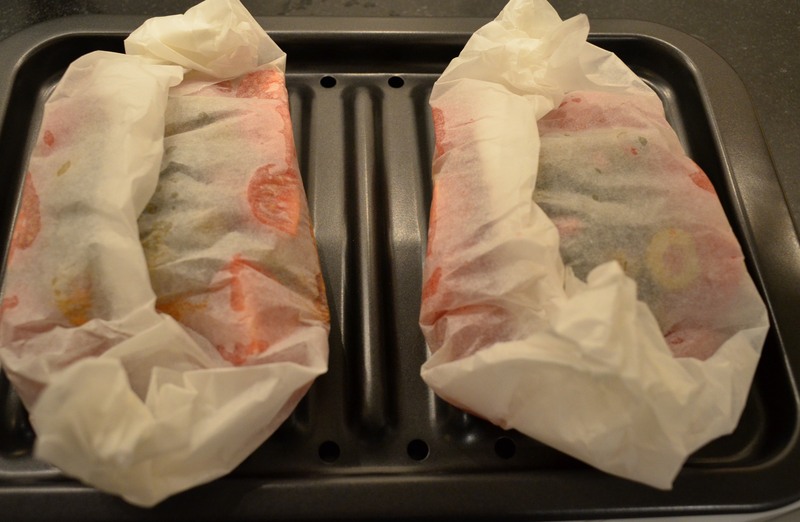 Remove seared fish pieces to the middle of each square of parchment paper. 7. 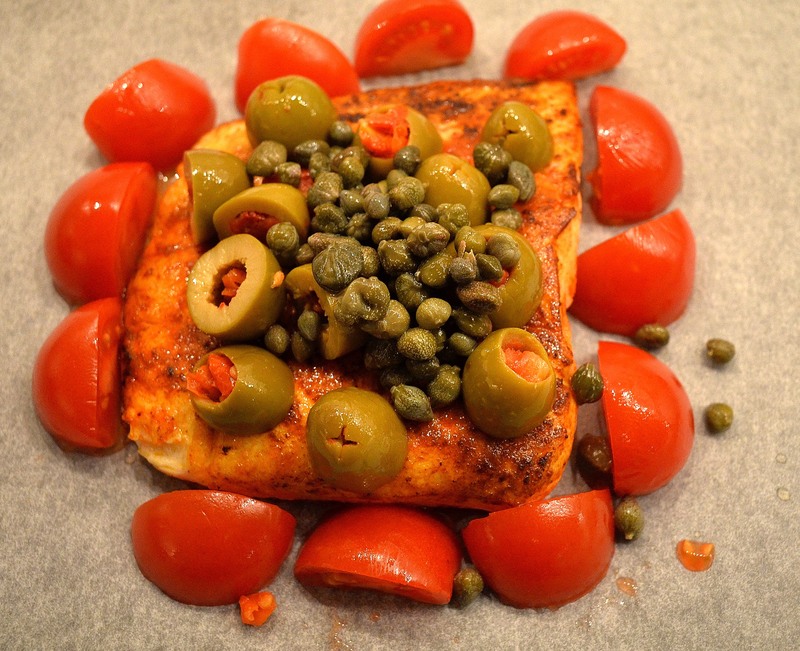 Arrange tomatoes, olives and capers on each piece and wrap into packages. 8. Place packages on a cookie sheet and roast in the oven for 10 to 11 minutes. 9. Carefully remove the packages from the oven, place each on a plate and gently open and transfer the contents to the plates.